6. Andres Iniesta Scores In Extra Time As Spain Clinch The World Cup For The First Time. World Cup Final, Johannesburg, 2010. Andresito. Little Andres. Wizard. Star of the show. The nicknames, clichés and superlatives rolled after the Barca man’s 116th minute strike. 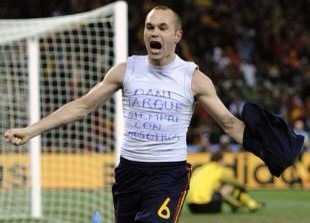 Iniesta, whipped off his shirt and demonstrated a gesture summing up his character; immediately paying homage to his fallen former close friend Dani Jarque. ‘Siempre con nosotros’, always with us, an unselfish tribute to his former u21 teammate who’d passed away from a heart attack in Italy less than a year earlier. Iniesta hadn’t always been a star in the eyes of managers. Frank Rijkaard hadn’t always picked Iniesta and had overlooked him for a starting berth in the champions league final in 2006, the Spain midfield had been packed with quality over the previous few years and patience was required in order to get one’s chance. In fact, in 2010, Iniesta may have counted himself lucky to be on the plane. In 2009, Iniesta suffered an awful thigh injury which would flare up four times over the next 12 months. Iniesta was restricted to 30 minutes of football in Barcelona’s final third of the season; a stat which would have ruled the majority of players out of an airbus 330 ticket. Ten days before the champions league final, Iniesta suffered a small tear to his thigh which would be strapped up so heavily by the Barca medical staff, it came with a disclaimer of strictly no shooting. The same injury would subsequently lead to the pre-mentioned problems and a massive dent in the diminutive midfielder’s confidence. Iniesta said: “I’d managed to create, let’s say, an image of an Andres Iniesta who played at quite a good level and the fact that I suddenly couldn’t perform like that really overshadowed my life. I got to the stage where I no longer had confidence in myself. I’d lost certainty that I could still do the things I’d always done – it was very tough. I’m pretty sure people outside the club didn’t realise how bad it got”. For Del Bosque, naming Iniesta in the squad was a risk, a gamble, but one worth taking. That looked to have backfired in a warmup against Poland, when a recurrence of his injury struck. It was, of course, ultimately a wise decision. Iniesta was given a DVD by a club physio named Emili Ricart who handles the recuperation and rehabilitation of Barca’s players. He recalled, “Things had reached a stage where Andres felt like this was a problem which was never going away – he was sinking.” Ricart cleverly understood players needed mental, as well as physical recuperation. On the flight, Iniesta, seated next to old friend Victor Valdes, stuck the DVD on and pressed play. Firstly, images were presented of Barca’s loyal assistant to Pep Guardiola, Manuel Estuarte, one of Spain’s most decorated water polo players. With nine minutes to go in the Olympic Games final against Italy, Estuarte’s Spain conceded an equaliser and lost the final in extra time. The great man, the Messi of water polo in Spain, was reduced to tears. Flipped forward seconds later, images adjourned the screen of Estuarte winning Olympic gold four years later in Atlanta. Next up, a horrific crash involving Fernando Alonso in 2003. His car, reduced to a shell, left behind a seriously injured Spaniard, stretchered from the scene. Moments later, the DVD flicked to images of Alonso, now in 2005, celebrating wildly at the scene of his crash as he wins the drivers’ championship for the first time. What followed, was Rafa Nadal beating Roger Federer to win an epic final at the 2009 Australian Open. The Swiss’ defeat, left Federer emotionally inconsolable, unable to finish his post match speech. The images skipped to Federer fighting back to win the French Open later that same year. Finally, a fitting way to end the DVD, there was Iniesta himself, down and out during a match against Villarreal in 2009, clutching his thigh muscle, his face stricken with the agony of the injury and the knowledge of its potential for ruin. The subsequent images were of him burying his effort into the top corner of the Chelsea goal in the final seconds of the champions league semi final, stripping off his shirt and sprinting towards the corner flag wildly. When the World Cup final arrived, Iniesta had started to cement a reputation as one of the world’s finest midfielders. He quietly went about his business, tiki-taka engrained in his psyche, swapping passes with his Barca and Spain teammates in small, localised, exclusive games of lend-and-borrow-ball, mesmerising markers attempting to even attempt to spoil their fun. The world had started to fall in love with Spain and Barcelona’s play, two of the Iberian peninsula’s great modern day representatives, both teams simultaneously, and synergistically, approaching their peak. The match itself, was a controversial affair. Dutch players clearly wanted to breakup Spain’s play – by any means necessary. 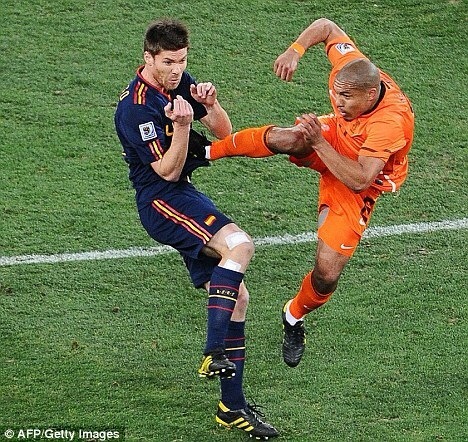 Nigel de Jong did an impressive impression of a flying karate kick, something similar to a video game, akin to when a beat-em-up classic like Tekken was hastily unwrapped by millions of eager Playstation gamers a decade earlier, completely taking out Xabi Alonso. Extremely lucky to stay on the pitch, the Dutchman escaped with a yellow card from Englishman Howard Webb. The game saw the most yellow cards ever dished out in a final, and Jonny Heitinga being sent off for two of those. Whilst Spain edged the stats, the Netherlands also had several chances to score, with Iker Casillas saving from Robben with their best chance when 1 on 1. In the 116th minute, with the game poised at 0-0, Spain had possession. With the ball at the feet of Cesc Fabregas after a move had seen La Roja progress to the left channel, following a cut-out pass looking for Iniesta from Torres, he passed the ball to Andres Iniesta who had remained in space 12 yards from goal. Iniesta touched the ball forward and smashed the ball into the net past Maarten Stekelenburg. Spain were ahead and with only 3 minutes left to play after the restart, they would not relinquish their lead. Extremely popular with the neutral, Spain had captivated the world. Their mesmerising play, their style, their way of producing and developing talent had earned respect throughout all of football. As a football coach, their attitude to the game and emphasis towards youth development meant it was fitting to see la seleccion win the World Cup for the first time and will be always be remembered as one of my favourite moments. This entry was posted in World Cup Moments and tagged Barcelona, brazil, FIFA, final, Holland, Iniesta, Netherlands, south africa, Spain, world cup. Bookmark the permalink.